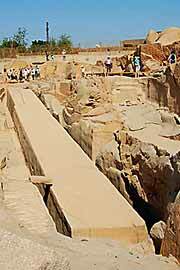 The pharaoes used the granite from the quarries of Aswan. On the islands of the Nil and at other places in the south of the city traces of the antique stone pits are still to be found. These, who plan to manufacture an obelisk for their home, are welcome to study work techniques of the stonemasons at the example of the unfinished obelisque. More than 40 meters long the "spit" was intended (so the English translation for the greek word obelisque), and would have become the highest, if ... a crack had not put an end to this vain plan. But also the concept to cut out a smaller obelisque was only a try: so he is still lying in the quarry to be gazed at. Waleed offers a package, to visit the Unfinished Obelisk together with Philae temple and Highdam including the car, driver a guide and the motorboat to Philae. If you like, you can also add a visit to Kalabsha Temple at Lake Nasser (including boat to Kalabsha and of course the guide). And then there was Said. If I saw the unfinished obelisk alone without a guide then it would be just a huge stone partly digged from a stone hill. 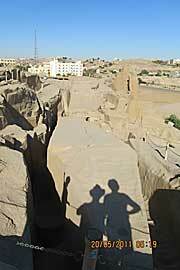 But he made me see hundreds maybe thousands of ancient Egyptians working on that site. I could see the impressive impossibly hardwork. Maybe we are a so much more weaker less creative generations compared to those ancient Egyptians.